Some churches simply stick in your mind and never go away. For me, one of those is St John Lateran, or, more correctly, the Archbasilica of St John in Lateran. 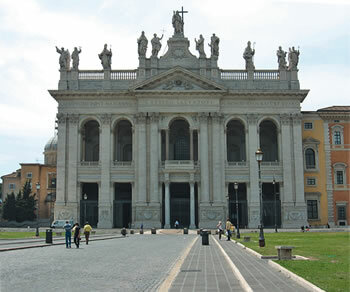 One reason is that the Dedication of St John Lateran is celebrated as a feast on 9th November each year, which reflects its importance as the mother church of the world. 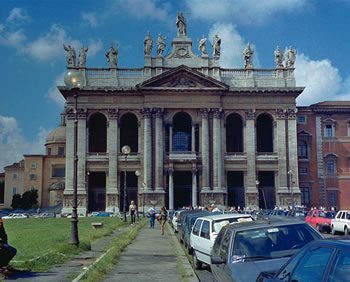 Although not within the Vatican, or even within the walls of ancient Rome, it is the most important of the four basilicas in Rome because it is the church of the Popes. After many changes, St John in Lateran took on in its present form in the 18th century. The latin inscription on the façade translates to “Pope Clement XII, in the 5th year of his reign, dedicated this building to Christ the Saviour, in honour of Saints John the Baptist and John the Evangelist.” The 5th year of his reign was 1735. 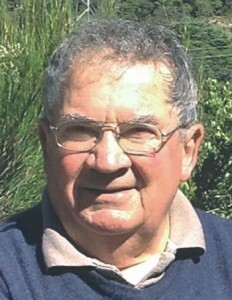 I have been fortunate in visiting the church twice, with a decade separating the visits. 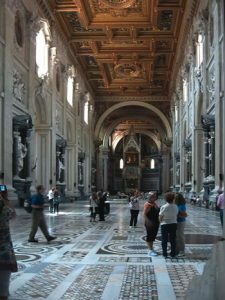 The first time we walked to it, the second time we were more familiar with Rome and took the metro to San Giovanni and walked through the wall to the square in front of the church. On our first visit we were not all that impressed by the façade, which was dingy and unkempt. The difference the second time was marked – the whole square and the façade was pristine. We could even read the inscription above the windows. On the first visit the nave was full of chairs, as there had been a Mass, and it was difficult to walk around. 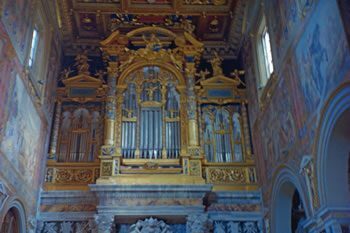 But we were impressed by the sheer beauty of the marble and decorations, including the statues of the 12 apostles, the Papal Altar and the organ (above). On our second visit the church was practically empty, and we could rove freely. The church is in the shape of a latin cross, with something of interest at every glance. The floor is inlaid marble. One apse we took to be designed for Papal audiences (next page, top left). There was also a particularly attractive side chapel, closed off by a grille and said to be reserved for the Pope (above, right). 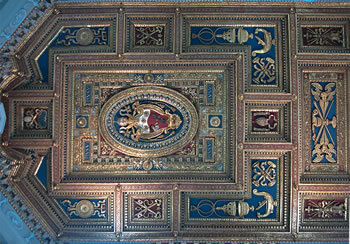 But to me the over-riding interest was in the ceiling panels, predominently gold and blue, dedicated to past popes. 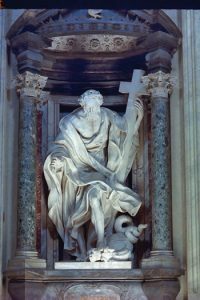 The example below is dedicated to Pius VI (1800-1823). 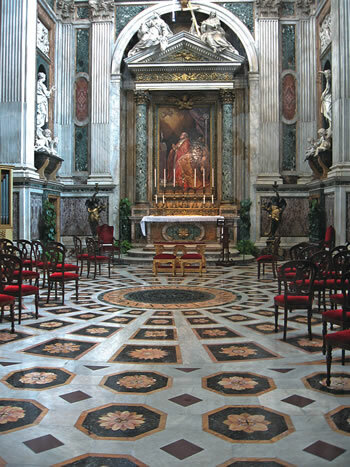 There are six papal tombs in the church, and twelve more tombs were destroyed by fires in the 14th century and their remains have been buried in a single tomb. The last pope to be buried in the church was Pope Leo XIII in 1903. As well as the statues of the apostles, there is reference somewhere in the church to most popes other than the ones I had earlier seen buried in Avignon. As I wandered around, I became more and more overcome by a sense of the history of my Catholic Church, an unbroken line of authority from Jesus and the apostles through the popes to today. Awesome.